Commercial Refrigerator,ATOSA MBF8005 Double 2 Door Side By Side Stainless Steel Reach in Commercial Refrigerators for Restaurant,44.5 cu.ft.33℉-38℉ +1/3 Size Steam Pan (MBF8005) by Atosa at In The National Interest. MPN: MBF 8005. Hurry! Limited time offer. Offer valid only while supplies last. ATOSA has 12 warehouses throughtout the U.S,we will ship the goods nearby.This Atosa MBF8005 commercial reach-in refrigerator boasts a 22.6 cu. ft.
ATOSA has 12 warehouses throughtout the U.S,we will ship the goods nearby. This Atosa MBF8005 commercial reach-in refrigerator boasts a 22.6 cu. ft. capacity and attractive rounded corners. The unit's heavy-duty 1/4 HP Embraco compressor is top mounted and self-contained. 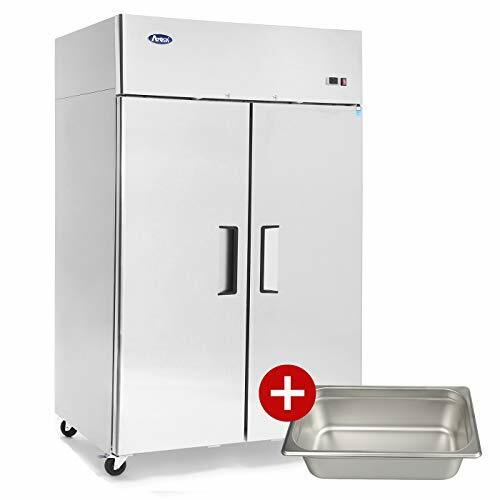 With an interior and exterior made of durable stainless steel, the durable refrigerator is easy to clean and designed for long-term commercial use. Its temperature ranges from 33° to 45°F, and its well-lit interior provides clear visibility of the refrigerator's contents.A Dixell digital temperature control system ensures the unit's interior maintains an ideal temperature, and an efficient refrigeration system helps this Energy Star-certified unit reduce overhead costs. The single door of this T-series commercial refrigerator is self-closing and also stays ajar if opened past a certain point. The unit also features standard safety door locks, recessed door handles, and magnetic door gaskets. Pre-installed castors make the unit easy to transport, while pre-installed shelves enable you to easily organize the items you're storing. With (3) adjustable shelves that can each hold up to 155 lbs., this Atosa MBF8004 commercial reach-in refrigerator can store several hundred pounds of products and measures 83.90"H x 28.70"W x 33.30"D. An electric defrost feature enables users to quickly and easily prepare food for cooking. 【TOP MOUNT COMPRESSOR】Top mount Compressor design is ideal for dry storage areas where ingredients might be spilled and locations where the floor can become dusty. Vortex Refrigeration Commercial Heavy Duty 2 Solid Door Refrigerator - 49 Cu. Ft.